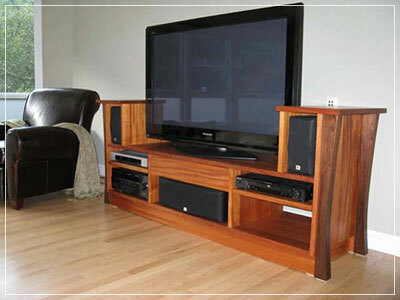 Our handmade, solid wood living room furniture selection is as diverse as the spaces our clients are trying to furnish. Our showroom features many pieces you can come in and enjoy but our online galleries display a more complete selection of pieces that we have made in the past, most of which we would be happy to make again for you. Come in and sit or recline to a horizontal position in one of our traditional craftsman reclining chairs, or wall hugging reclining loveseat or sofa. Available in various hard woods, leather and fabrics customized to your desire! At Made in Pescadero we also maintain an inventory of unique coffee tables, end tables, shelving systems and more. You will also find fine art and ceramics to complement your living room furniture, lighting, handmade crafts and more. Dining tables, chairs, buffets, sideboards, china cabinets and hutches. Entertainment centers, coffee tables, end tables, chairs, rockers, loveseats and ottomans.